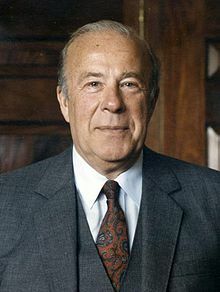 George Pratt Shultz (born December 13, 1920) is a former United States Secretary of Labor (from 1969 to 1970), U.S. Secretary of the Treasury (from 1972 to 1974), and a former U.S. Secretary of State (from 1982 to 1989). We should say we think a big element in the process of seeking peace [in the Middle East] is the acceptance of Israel's existence and so we´re going to go around to all our friends in Europe and Asia and elsewhere and say let´s accept Israel´s right to exist - and a way of doing that is to move our embassy to west Jerusalem. As long as the embassy is in Tel Aviv, it sort of says we´re camping out. "New York Post", June 21, 2003. Why We Support a Revenue-Neutral Carbon Tax: Coupled with the elimination of costly energy subsidies, it would encourage competition. "Commentary" article in the Wall Street Journal, co-authored with the Nobel-Prize-winning economist Gary Becker, dated April 7, 2013. Many of today's trading relationships actually make America more globally competitive. . . . Raising tariffs among the United States, Canada and Mexico will only weaken a well-oiled manufacturing machine that is driven by the high level of integration the three economies have in their supply chains. This integration makes the region as a whole more competitive vis-à-vis the world. A better way than tariffs to improve America's trade picture. CNN opinion article written jointly with Pedro Aspe, Mexico's former secretary of finance, published June 1, 2018. When current events set us thinking about which former Washington policymaker might have something interesting to say about this story or that story, the name of George Shultz inevitably comes to mind. Robert Siegel, co-host of National Public Radio's news program All Things Considered, introducing Shultz prior to an interview which was broadcast on October 4, 2017. This page was last edited on 7 September 2018, at 13:11.